On 9 May 2016, the World Head of the Ahmadiyya Muslim Community, the Fifth Khalifa (Caliph), His Holiness, Hazrat Mirza Masroor Ahmad delivered the keynote address at a special reception held in his honour at the Hilton Hotel in Copenhagen, Denmark.More than 125 politicians, academics and community leaders attended the historic event, including H.E. Mr Bertel Haarder, Minister for Cultural Affairs and Minister for Ecclesiastical Affairs. During his keynote address, Hazrat Mirza Masroor Ahmad spoke about the peaceful objectives of the Ahmadiyya Muslim Community and the claim of its Founder, His Holiness, Hazrat Mirza Ghulam Ahmad (peace be upon him).His Holiness refuted the allegation that Islam was spread by the sword and used Quranic references to prove that Islam advocates universal religious freedom and tolerance. 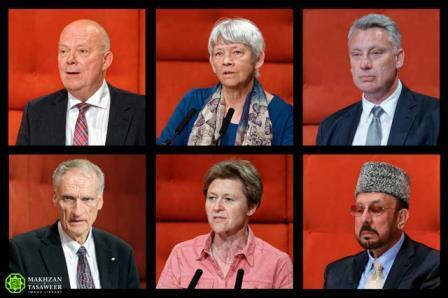 His Holiness also addressed the issue of freedom of expression and the refugee crisis afflicting Europe.A number of dignitaries also took to the stage to welcome Hazrat Mirza Masroor Ahmad to Denmark and to express their support for the Ahmadiyya Muslim Community.Hazrat Mirza Masroor Ahmad began the keynote address by outlining the primary objectives of the Ahmadiyya Muslim Community. “If one reads the Holy Quran and assesses the life of the Holy Prophet Muhammad (peace be upon him) through a lens of justice, rather than through a lens of prejudice, they will soon realise that Islam is a religion of peace. They will realise that the Holy Prophet (peace be upon him) desired peace with every fibre of his being.”The Head of the Ahmadiyya Muslim Community stated that during the era of the Holy Prophet (peace be upon him) and his four rightly guided successors (Caliphs) the rights of all people were protected regardless of religion or belief. Citing the period of Hazrat Umar, the Second Khalifa (Caliph) of Islam, Hazrat Mirza Masroor Ahmad informed that the Christians of Syria preferred to live under Muslim rule as opposed to the Roman Empire, knowing full well that Muslims would uphold and protect their rights. Hazrat Mirza Masroor Ahmad also spoke of how the Holy Prophet of Islam (peace be upon him) once rebuked a very close companion for offending the feelings of a Jew by claiming that the Founder of Islam was of a higher status to the Prophet Moses (peace be upon him). “If we truly desire peace in the world, we need to think of the consequences of our words and deeds. We need to be respectful of the beliefs and values of others. This is the way to break down barriers and to knock down the walls of enmity and resentment that have been erected in so many parts of the world.”During his address, His Holiness condemned all forms of terrorism and extremism as “hateful and wicked” and said that such acts had no link whatsoever to Islam’s teachings. His Holiness also condemned certain non-Muslim powers for adopting “unjust acts and policies”. “May we soon emerge from the bitter conflicts of today to a better and brighter future in which all nations and all groups are able to live side by side and in which a spirit of love, compassion and humanity prevails.”Earlier in the evening a welcome address was given by the National President of the Ahmadiyya Muslim Community in Denmark, Mr Zakaria Khan, followed by various guests speeches. The event concluded with a silent prayer led by His Holiness, Hazrat Mirza Masroor Ahmad. Both prior to and after the event, His Holiness personally met with various dignitaries and guests. 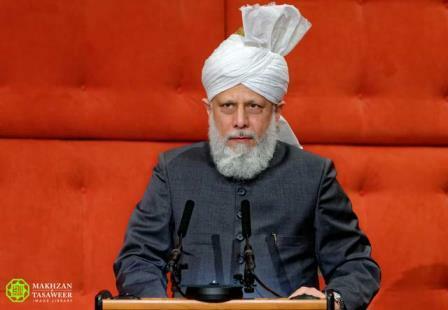 Share the post "Head of Ahmadiyya Muslim Community delivers historic address in Copenhagen"